Welcome to Into Labels, a Who What Wear column that profiles the designers behind the brands we can't stop talking about. Over the last few years we’ve seen a strong focus towards slow fashion. Brands rethinking their values and purpose, and working collectively towards a more sustainable future. Charlotte Hicks, founder and designer of Esse Studios focuses not only on ethical production practices, but is also pioneering a new way for women to build their wardrobes. The idea behind the brand, which launched in 2018, is to help women take a considered approach to their style and consume consciously. The label releases ‘editions’, each designed to be worn with the last, rather than pumping out multiple collections per year. 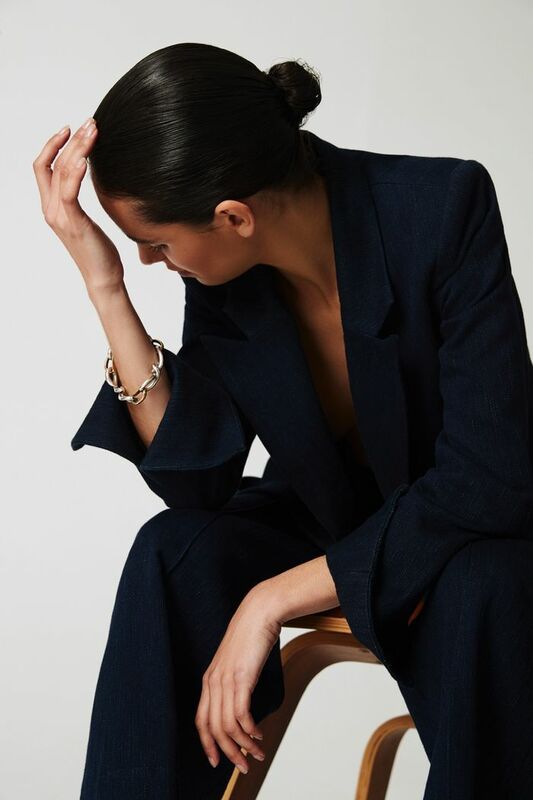 Drawn to the label for its minimalism—considered white shirting, ribbed knitwear, and tailored denim, we sat down with Hicks to learn more about the story behind Esse Studios, what we can expect next from the emerging Sydney-based brand, and how she got the label off the ground. What was your experience before launching your label? I've been designing for a handful of Australian brands for over a decade. After my fashion and textiles design degree at UTS, I went on to cut my teeth at Zimmermann. Being thrown into the deep end you either sink or swim. You learn the hard way that the engine room is not as glamorous as it appears. But passion for what you do and appetite to learn your craft gets you through. I worked for other Australian brands after that, from bigger brands to smaller start ups where I got to experience all sides of the business. For the past five years I have been designing at Sass & Bide. I knew I wanted to create something that was more thought provoking and had a real conscious. A brand with personality that represented more than just garments. It was about two years ago that I had the real moment of clarity. I had a lot of views around the industry and product. For me the light globe moment was when I realised that the brand just needed to embrace and harness all those ideals. That was going to be my point of difference. It was at that point that I started really putting pen to paper. The first collection took a good year to create. How did Esse Studios start? What’s the story? It really was this convergence of ideals and values that spurred the beginning. Some were more intangible, more pertaining to the ethos of the brand. There is so much pressure as a designer to continually keep coming up with newness, there is this constant need for more and more. The very cyclical nature of the fashion calendar is built around this perpetual need to discard previous seasons and make way for newness. When you take a moment you realise just how damaging fuelling this beast really is—not just environmentally, but culturally too. Clothes with built in obsolesce encourage us to keep mindlessly consuming. This gave way to the whole approach. I wanted to create editions that were capsules collections designed to be ‘built on'. Each edition would be worn and styled back with the last so you don't discard your previous investments. There is seasonal relevance, but the idea is you invest in timeless pieces you can keep forever. Naturally the more product that is being consumed the less value people are placing on the garments themselves. The integrity of the craft, the desire to understand what goes into the process seems to be less of value. So I wanted the brand itself to represent a return to the craft, something that for me reflected why I love what I do. A label that is informative and educational and encourages others to slow down and appreciate the artisanal integrity of each piece. Who is the ideal person you’re designing for? The aesthetic values in each piece echo the women I am designing for. She is modern, progressive and empowered. Masculine and strong but with a refined and timeless femininity. She values authenticity, humility and integrity above all else. There is something unexpected and intriguing about her though—free spirited taking her own unique path, constantly questioning the status quo. But she also keeps it real, raw and honest—she doesn’t take herself too seriously. What’s your inspiration behind the designs? I think it is definitely about the Esse woman! I have who she is in the mind and I try to think about her everyday. What does she need from her pieces, want does she want? Each piece reflects her. There are all the qualities that I love about her wrapped up in each piece. She is informed and aware of the world around her. I am also very much inspired by the things she appreciates—the history of the craft, art and culture. I want her to feel amazing wearing Esse. This is just as much about feeling great as it is about comfort and being able to function in the day to day! I want to create clothes that are actually designed to be worn, loved and lived in. What have been some of the biggest challenges in getting the brand off the ground? THE EDITING! It’s been my job for over ten years now to churn out newness and innovation every day. Being able to finally do exactly what I want is the most thrilling part. The discipline to know when the stop, when you have arrived and that you don’t need to 'overcook it' is the biggest challenge. The brand’s ethos is exactly that, don’t just put any thing out there—be considered and curated. Finding that balance can often be a challenge. So in a sentence: controlling my excitement! What can we expect from Esse Studios in coming collections? I’m excited to see where the brand goes organically and how it evolves. I want to try to keep that strong aesthetic underpinning—‘reframing the classics' with a tailored, functional and masculine edge. Although I do want to build on that. Layer it up as well as inject some elements of the unexpected! I’ve always played with multiple ways of wearing garments. Sometimes my designs come from literally wearing a garment the opposite way to how It was intended. This has always been a big part of my creative process too. Wearing a shirt three different ways is something I have done just to give ‘mileage' to my wardrobe. So with longevity and versatility being a big focus for the brand, there might be more of an exploration on slightly more transformative pieces. Who would you love to see wear the brand? There are so many women around the world that I would love to see wear Esse. Strong women who know who they are and are in harmony with that. Women who just do things differently continue to inspire me. They might be creatives, philanthropists or just woman out there being true to themselves, questioning and challenging life—stepping outside of the norm. For me, it is more often than not, the ones doing it quietly too. The humble hard working quiet achievers, so sometimes I just love seeing that amazing woman grabbing a coffee whilst juggling life’s many ‘balls’. At the risk of sounding cliche it has always been the ‘old’ Celine philosophy of ‘being real’ that has resonated with me. Women like Phoebe Philo inspire Esse everyday.